Provide comfort for the family of Yvonne Throop with a meaningful gesture of sympathy. Our dear mother passed away quietly in the early morning hours of the 29th of December 2018. 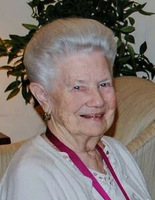 Yvonne (nee Moulton), beloved wife of the late Irwin Throop. Much loved mother of Lisa (Paul Simmons) of Kingston, Rob (the late Lloyd Ward) of Toronto, Paul (Julie) of Kingston, Dan (Adelle) of Prescott and Jennifer (Warren Fletcher) of Kingston. Cherished grandmother of Sarah , Sebastian, Adrianne, Ellie and Darius Simmons, Jamie, Benjamin and Sophie Throop, Sarah, Michael and Adam Throop, and Marcus Fletcher. Also survived by brother Joe (Mary) Moulton of Spencerville, along with numerous nieces and nephews. Predeceased by brothers Edgar, Chester, George, Paul and sisters Theresa, Jean Porter and Betty Rauscher . The family would like to extend their gratitude to the staff and nurses of Kingston General Hospital for their compassion and care of Yvonne. A service and burial will be scheduled for late spring. A service and burial will be scheduled for late spring. Provide comfort for the family of Yvonne Throop (Moulton) by sending flowers. Please accept our condolences in the loss of your mother. As the oldest niece in the Moulton family I spent several summers with Aunt Yvonne and Uncle Irwin, cherishing the memories.